Although the 2013-2014 NBA MVP Kevin Durant will be out for the beginning of the pre-season due to a foot injury, Nike Basketball will still keep the colorways of his seventh signature sneaker rolling in. They’re now gearing up to release the “On The Road” rendition of the KD7’s. Just like the past years “Away” renditions, the 7’s come in a predominately black upper with hints of blue and orange throughout silhouette which match the OKC Thunder’s road jerseys. In the video above, KD gives some insight on his experiences on the road and mentally and physically preparing to play on those long nights away from home. 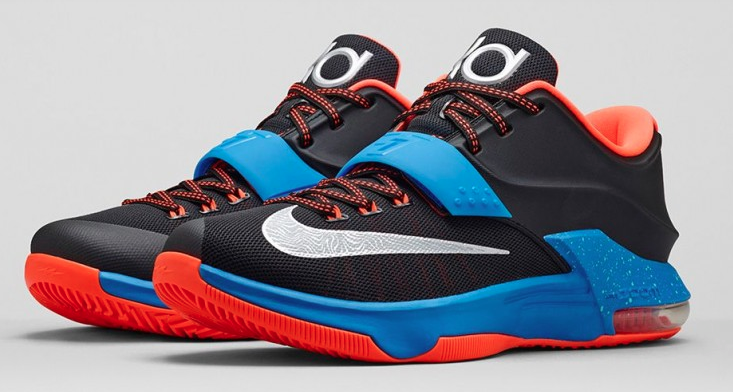 The “Road” colorway of the Nike KD7’s will be available tomorrow (October 23rd) at all Nike retailers and all over at the brands online store. Check out details images below.